IREPS YouTube: How to search tenders through Advance Search on IREPS? IREPS YouTube: How to Login into IREPS Application as a Vendor/Bidder for Supply Tenders? IREPS YouTube: How to Login into IREPS Application as a Bidder for E-Auction Sale? IREPS YouTube: How to search tenders through Quick Search on IREPS? IREPS YouTube: How to Login into IREPS Application as a Vendor/Bidder for Works Tenders ? 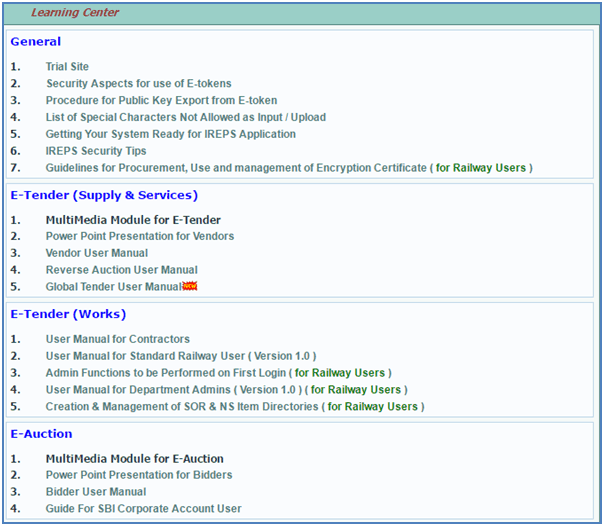 IREPS Works Tenders: How to See the Corrigendum for Works Tenders in IREPS? Corrigendum list icon is displayed in all the Folders in Middle body of the Bidder Home Page and in the Search Tender page for all published tenders, for all tender types. Clicking on this icon opens the Corrigendum page, whereby the users can view the list of all the corrigenda that have been issued after publication of the tender. Clicking on the View Corrigendum details icon in Action Column opens the individual corrigendum. A Corrigendum is divided into three parts for showing conditions which have been modified, deleted or added. If the advertised value of the tender is changing due to the corrigendum, the same along with the revised Earnest Money and Tender document cost are also shown in the corrigendum. The online bidding page shown to the bidder for preparation/submission of bid includes all the changes made through the issue of corrigenda. IREPS Works Tenders: What is the Significance of the Different Blocks of the Tender Document? 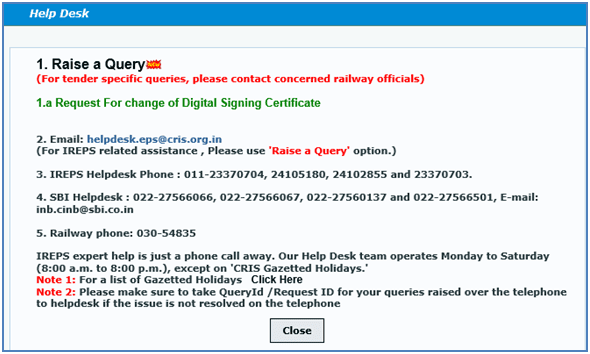 What is the Use of Learning Center Link for IREPS Users? The learning center link gives the user access to the repository of the manuals, guidelines and suggestions to make the user familiar with the various functionalities and process flows of IREPS application. The links to general documents/procedures/instructions etc. are available in the General section, and the links to manuals specifically related to Works Tenders as and when these are issued will be available in the section titled E-Tender (Works). The General section also contains the link to the Trial site of IREPS application.